Video clips showing process of extragalactic jet breaking down over thousands of years. University of Leeds researchers have mathematically examined plasma jets from supermassive black holes to determine why certain types of jets disintegrate into huge plumes. Their study, published in Nature Astronomy, has found that these jets can be susceptible to an instability never before considered as important to the jet's flow and is similar to an instability that often develops in water flowing inside a curved pipe or a rotating cylindrical vessel. Dr Kostas Gourgouliatos conducted this research while based in the School of Mathematics at Leeds. He is now based at Durham University. He said: "These jets have a narrow oval shape which gives them a curved boundary. It is this shape that creates a weak point in the jet. "Instability starts at the curved boundary, travels upstream on the jet and then converges at one point - what we refer to as the 'reconfinement point'. Below this point the jet stays tidy and tight but everything above will be destroyed and creates a large cosmic plume. "When the jet disintegrates into a plume it releases heat, making them easier to spot on telescopes. The jets and their plumes are so bright that sometimes they outshine their host galaxies and are always more easily spotted than black holes, which are inferred indirectly, in space observations." 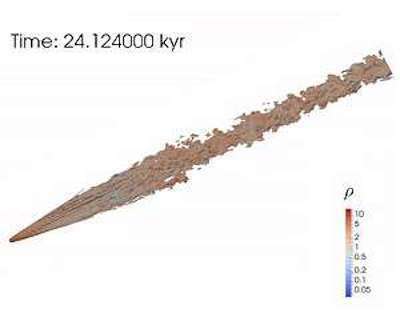 The study explains why the extragalactic jets, which at first appear remarkably stable, may become suddenly disrupted and produce plume-like structures. Study co-author Professor Serguei Komissarov, also from the School of Mathematics, said: "We did expect instability associated with velocity shear to develop at the jet reconfinement but not as fast. "Moreover, the observed instability exhibited some rather unexpected features. In turned out that it was related to the centrifugal force acting on the fluid elements travelling along curved streamlines. This centrifugal instability is well studied but nobody expected it to be important for the jet dynamics."